This mini 3 ring binder comes with 50 two-sided lined recipe pages for handwriting recipes and 8 tab dividers with categories and one pocket. This standard sized mini binder measures 5 1/2" x 8 1/2" and will accommodate other manufacturer's plastic sleeves, pockets, and tab dividers. This easy to handle, mini recipe journal measures 5 1/2" x 8 1/2" x 1 7/8" deep and includes 50 two-sided lined recipe pages and 8 tab dividers with categories. Hand write your favorite family recipe on the lined recipe page and then add it to the appropriate category and personalize your recipe organizer on the inside cover. Refill packs are available of lined recipe pages for handwriting (Meadowsweet Kitchens Lined Recipe Page Refill Pack for the Favorite Family Recipes Journal, Grandma's Kitchen design). This standard sized mini journal will accommodate other manufacturer's 3 ring binder 5 1/2" x 8 1/2" plastic sleeves, pockets, and tab dividers. 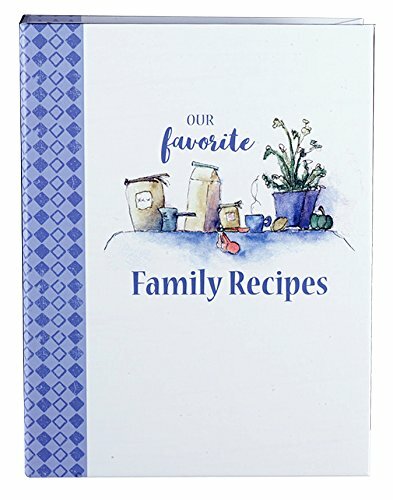 Our Treasured Family Recipes Journal is also available for handwriting or computer printing your favorite family recipes. If you have any questions about this product by Meadowsweet Kitchens, contact us by completing and submitting the form below. If you are looking for a specif part number, please include it with your message.